Our Hand Tied Canopies, Coverlets, Table Overlays and Window Valances will provide you with many years of beauty for your home. 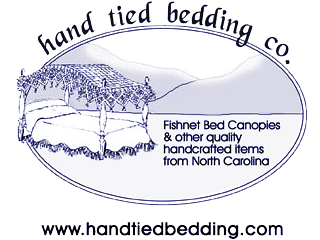 Our Fishnet Bed Canopies, as well as all of our Fishnet Items are hand washable and preshrunk. We recommend these care instructions when washing your bed canopy. Hand wash, cool water, mild detergent. Line dry or lay flat on a sheet to dry. Smooth down tassels as needed while still wet or damp. Do not dry clean or place in dryer.